In the New York Times recently, Bettina Elias Siegel reports on the state of school lunches in France as shown in Michael Moore’s new documentary film Where to Invade Next. To many of us who have watched children’s reactions to food over the years, it is surprising to learn that in a village in Normandy, French school children are served “scallops, lamb skewers and a cheese course” for lunch. That sounds like a gourmet’s dream, but of course if this meal were served in an American school there would have to be many other options—what about the vegetarian children? or the ones who are allergic to fish? Or cheese? Most American children have learned to be picky and opinionated about food before they even start school. Siegel (and the film) contrast the French school with a typical American high school where the students choose pizza, French fries, and other unhealthy meals for lunch, washed down with sugary soft drinks. Siegel makes many good points in her article pointing out that Americans are unwilling to support the infrastructure that would allow children to be given healthy, locally-sourced food for their school lunches. Americans have opted out of paying any but the lowest taxes possible to support children’s needs, in the expectation that competition among corporations will somehow provide the best options for school meals. Are we really surprised that this hasn’t worked? Instead of an array of healthy foods, most school districts yield to the economic necessity of presenting children with the cheap, highly-processed foods they have learned to enjoy. Perhaps the time has come when we should teach our children to prepare their own school lunches. They might surprise us. Over the years, a number of reformers have tried to help Americans learn how to cook healthier, inexpensive food to feed their families. Back in 1883, when America was suffering through one of its worst depressions and many people were unemployed, a woman named Juliet Corson decided she could help people cope with poor wages by teaching them to cook. Born in 1841, Juliet leaned to cope with poverty when her stepmother kicked her out of the house and told her to earn her own living. Juliet became a librarian at the Working Woman’s Library and found out how difficult it was to feed a family on small wages. She started giving cooking lessons to women and then to children in New York City and soon began writing books about cooking and household management. 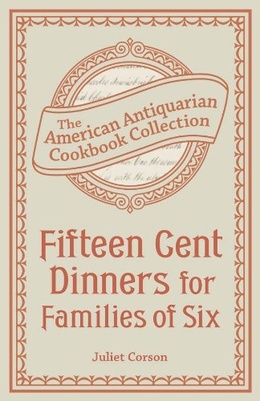 Her most successful book was called, believe it or not—Fifteen-Cent Dinners for Workingmen’s Families—and she gave away an edition of 50,000 copies; it was even reprinted in a daily newspaper. The menus suggested were wholesome with easily available ingredients. The book suggested meals such as rice and milk for breakfast and corned beef and cabbage for dinner. It included tips for choosing meat and vegetables at the market. Many readers were delighted with the worked and thanked Corson profusely, but, as always, not everyone was pleased. Some union leaders objected to its distribution on the grounds that if the bosses thought workers could feed their families so cheaply, there was no need to raise wages. It seems as though you can’t win when you give advice about what people should eat. 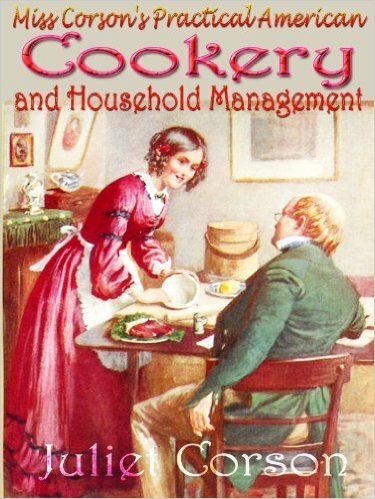 Juliet Corson had a successful career as a writer and lecturer and she started the New York Cooking School, one of the first successful cooking schools in the country. Although she charged her middle-class students for their lessons, she always provided free lessons to those who could not afford to pay. She was a pioneer introducing the teaching of cooking into the public schools in America and Canada. Nonetheless, she died in poverty at the age of 57 in 1897, and the teaching of choosing food and cooking has almost disappeared from American schools. Perhaps it is time to revive the idea.